Sunderland Harrier Michael Barker (381) passes a lapped runner. 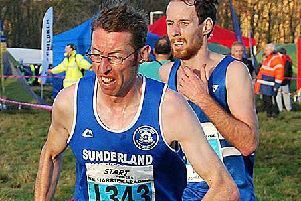 The North East Masters’ Cross Country Championships attracted one of their biggest entries for years at the Rising Sun Sports ground at Wallsend on Saturday. The venue, a former pit heap, now a grassed area, looked a winter picture with its snow covered hills and picturesque landscape, which made it an attractive venue for the cross country stalwarts. Sunderland Harriers and Sunderland Strollers made the most of the wintry conditions by picking up many individual and team medals in negotiating the icy and snowy conditions. 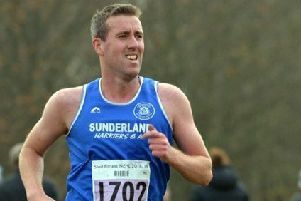 And pride of place among the Harriers’ must go to new Over-35 master, Sunderland Harrier Michael Barker, for his runners-up place behind Gateshead Harrier Conrad Franks. Franks, no doubt inspired by his call up for the North East Inter County team, had a comfortable victory (28.45). But Barker can be well pleased with his performance (29.28), considering it was a good field. There was another fine performance for the Harriers in the Over-50 category by Tim Field. He finished 15th overall (31.18) in taking the title and leading the club to team success with backing from Michael Thompson 21st (32.09) and Darren Stoker 39th (34.20). Paul Merrison made it a hat trick of wins for the royal blue vests by triumphing in the Over-60 class, with a winning margin of over three minutes in finishing in 31st place overall (33.56). Clubmate Paul Redman added to the medal tally with third place (33.57) in the Over-55 age group - one place behind Merrison. The Strollers had medallists in the Over-65 event with David Langrish second (27.38) and Peter Myerscough third (27.56). And the Over-55 team of Ken Maynard (34.16), Richard Barker (37.10) and Malcolm Cox (39.56) won their team contest. The separate women’s race was won by Over-45 New Marske athlete Sharon Bulman, who like Franks in the men’s race scored an emphatic victory, winning by 31 seconds. In second place was Morpeth Harrier Gemma Floyd (22.34) with Durham City Over-40 Joasia Zakrzewski taking third (23.12). Stroller Wendy Chapman, making her Over-50 debut and gaining a silver medal, found Gateshead Harrier Jane Giles just a bit too good for her. She was 16 seconds ahead at the end of their race. Sunderland Harrier Nikki Woodward followed Giles and Chapman home in finishing sixth overall (23.40) to finish second Over-40. Stroller Ashleigh Bennett was second Over-35 in 12th overall (24.57) and Dawn Elliott took the Over-55 silver medal (27.43). Lyne Valentine won bronze in the Over 60 age group (28.16) and Sheila Hudson was third Over-65 (34.54). Morpeth Harrier Over-80 Walter Ryder made the longest journey to the championships when he travelled from Cromarty in the North of Scotland. His journey was made worthwhile as he won his category.